Home › Uncategorized › Guess Who’s Coming to Dance? Guess Who’s Coming to Dance? Guess Where and Guess Who! The global Dance4Peace on Earth project is growing every day, as dancers sign up to submit their videos. 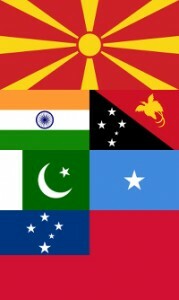 Six new countries are represented as of this week, and their flags are in this image. Do you recognize them? Bhutan continues to be the country with the most total dancers signed up. However, Tunisia and Nepal are now tied for second place, with Morocco and Venezuela close behind. Some of our new dancers are professionals, performing in their own countries. Others just like to dance for fun. 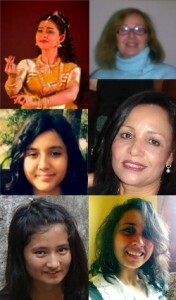 In the picture here, you see six faces. One of our Dance4Peace dancers appears in her traditional dance costume and makeup. In her own country, she’s won awards and received accolades for her classical dances. So which of the other five pictures is of her without her special costume and makeup? From top left and clockwise, the pictures are of [Mystery Dancer], Vasilka, Nadia, Madhuchhanda, Pooja, and Khaoula. Who is the Mystery Dancer? Answer: Look in the lower right-hand corner, and say hello to Madhuchhanda from Calcutta! That is her, in the upper lefthand corner, in one of her special dance costumes. Amazing! For extra credit: Where are the women from? What countries?